Good post sir i'm so glad. As you start to delve into the world of online marketing, it is important to be able to understand the terminology being used. We always try to limit the “tech talk” when possible and use terms normal folks use; however, there are times when there simply isn’t another word to use. You may also be reading though other resources and run into confusing terminology. So, we have created the Church Marketing Online Search Marketing Glossary. We encourage you to look over this dictionary of search marketing terms before you begin reading through the rest of the articles. We also encourage you to bookmark this page so you can visit the page if you ever run into a word or acronym you are not familiar with. If it’s search marketing related, you should find it here. If not, post a comment to request a definition. Alt Tag: Alt tags are attributes that can be added to pictures. They are primarily used to provide accessibility to blind visitors using a screen reader and visitors who have pictures turned off in their web browser settings. In terms of SEO, search engines can’t read pictures, but they do read alt tags. So, alt tags allow you to get some SEO value from those pictures on your site. Generally, the alt tag should describe the picture, but you can usually do that in a way that includes a keyword or two. You can add an alt tag to a picture by adding alt=”” in the img tag. If you are using a web builder, their may be an alt option or possibly a description or title option. Alt tags are viewable by visitors. If someone mousse over a picture, a text box will show the alt tag. Analytics: Software designed to monitor and report on website statistics. This includes where visitors come from, where visitors go when they exit the site, when visitors visitor the site, how many people visit the site, where people go when they are on the site, etc. Authoritative Website: A website which is given high value by the search engines within a specific field. These websites are typically very popular and have many relevant inbound links. Authoritative websites also typically have been active for many years. Behind-The-Scenes Optimization: Optimization done to parts of the web page which are not visible to visitors or seldom seen. This includes the Title tag, META tags, alt tags, and other elements. Black Hat SEO: Search Engine Optimization practices which are not approved by the search engines and can result in punishment or banning in the search engines. Some examples of Black Hat SEO are keyword stuffing, cloaking, doorway pages, and hiding content, among others. Click-Through Rate: The percentage of people who click on an ad or link compared to the number of people who saw the ad or link. For example. If an ad was displayed 100 times and 10 people clicked on the ad, the click-through rate for that ad would be 10%. Cloaking: When cloaking you have two web pages. One page is designed for the search engines and the other is for human visitors. The server is set to deliver the page designed for search engines to the search spider so they do not see the page designed for the humans and vice versa. Cloaking is sometimes done for the simple reason of the designer not finding a way to implement SEO practices in a way that still presents an attractive and compelling design to human visitors. Other times cloaking is much more insidious where search engines are shown a page about one subject and then humans are shown a about a completely different (and often unwanted) subject. Conversion: The process of a website visitor compmleting an action on a website which the webmaster wants visitors to complete. This may be when a website visitor contacts the organization, when a visitor becomes a member of the site, when a visitor purchases a product/service, etc. When the visitor completes the desired action it is conversion as they are “converted” into a member/client/customer. Cost Per Click: The fee charged each time a person clicks through a pay-per-click ad. Description Tag: The description tag is not as heavily weighted by search engines as the Title tag, but it should still be optimized. It is located in the head of the page, usually just below the title tag. The coding for the description tag is, meta name=”description” content=””. The text used between the quotes after content= is your description META tag. The description tag is not seen on the web page, but some search engines do use the description tag in the search listings. The description tag can be longer than the title tag, but should still be relatively short and should contain each of the keywords you are targeting. Directory: An online catalog of websites. While most directories do have a search feature, they are not search engines. Directories contain a list of categories and sub-categories in which listings for websites are placed. Domain Name: A name which appears as part of a website’s URL. For example, CMO’s domain name is churchmarketingonline.com. This name appears in the URL of each of our website’s pages and files. It can also be used in email addresses, such as bob@DomainName.com. Doorway Page: Doorway pages are pages designed for the search engines that human visitors never actually see. Unlike cloaking, a human visitor may actually go to the page, but they are quickly redirected to another page, sometimes so fast that the visitor doesn’t even realize they were redirected. General Search Results: Results returned from searches made in the search engines using their regular search function as opposed to using search features which filter results such as local search, image search, video search, etc. H Tag (Paragraph Headers): H tags are used for paragraph headings and titles. There are 6 H tags, H1 through H6. In HTML these tags include several characteristics, including size, weight (boldness), and a line break. An H1 tag will be very large and bold, while an H6 tag is small. In terms of SEO, because these tags are used for headings and titles, the search engines place extra weight on words used in H tags. The weight they give also depends on which H tag is used. H1 is given more weight than H3 and H3 more weight than H4. Keywords can be used in H tags as an SEO practice. If you do not like the appearance of the text when it’s placed in an H tag, then you can use CSS or HTML to change the font attributes, though there is some debate as to whether that effects the amount of weight the search engines give the H tag. Hidden Content: The practice of putting text on a page for search engines to read, but is not easily visible to visitors. Some examples of hidden content are hiding text behind a picture, making text too small to read, or making text the same color as the background. Inbound Link (aka backlink, incoming link): A link located on a site which directs visitors to your website. Internal Linking Structure: A term referring to the way web pages link to each other within a website including the location, method, and frequency of the links. This can include the navigation menu, the site map, and content links. Internal Linking Structure does not include links to other websites or incoming links. Internet Yellow Pages: Online phonebook websites. While this does include YellowPages.com, this does not just refer to the yellow pages website. It refers to all online phonebooks such as Super Pages, Yellow Book, and Yellow.com. Keyword: Words or phrases used to do a search in the search engines. Keywords can include either a single word or a multi-word phrase. Keywords are sometimes referred to as search terms or search phrases. Keyword Competition Research: Research done to determine the keyword difficulty of specific keywords in relation to other keywords and the page strength of the page being optimized. Keyword Density: The measurement in terms of percentage of the number of times a keyword is used on a page compared to the amount of total text. If there are 100 words on a page and a keyword is used twice, it would have a keyword density of 2%. Keyword Difficulty: A measurement of how competitive a keyword is, thus indicating how difficult it will be to rank well for that keyword. Keyword Effectiveness Index (KEI): A form of keyword competition research that evaluates the value of targeting a keyword by looking at the number of results returned by a specific search engine for a specific keyword in relation to that keyword’s keyword popularity. The KEI increases with higher keyword popularity, The KEI decreases with a higher number of results listed in the search engine. Keyword Popularity: The measurement of how often searches are performed for a specific keyword. Keyword Stuffing: The practice of putting a bunch of keywords on a page, in a META tag, in an alt tag, etc. for the purpose of influencing the search engines. This is not to be confused with simply using keywords in these elements, but when you use the keywords you shouldn’t just stick a bunch of keywords in some chaotic fashion. The text should make sense and should not just be a list of keywords. Keyword Tag: The keyword tag is honestly all but ignored by the search engines at this point, but it should still be optimized. Every little bit helps. It is located in the header of the page, usually just below the title tag. The coding for the description tag is Link: Also known as a hyperlink, a link is a clickable word, phrase or picture which directs a visitor to a different web page or file. Links are most commonly used as navigation menus allowing people to move from page to page within a site. Links are also commonly used to link from one website to another. Landing Page: A page where visitors are directed to when they click on an online ad or pay-per-click ad that specifically relates to the topic of the ad. For example, if church has an ad related to Sunday morning worship, a landing page may be a page that has a description of the church’s Sunday morning worship services and a list of service times. Landing pages may be existing pages on a site or may be created specifically for an ad. Link Reputation: The keyword reputation a link passes by including that keyword in the anchor text or, to a lesser extent, in the alt text of a graphic link. Using keywords in link text gives the page the test link links to the link reputation of those keywords making it more likely to rank well for that keyword. Link Building: The process in which people work to get other websites to link back to their site. This can be done in several ways including emailing website owners requesting a link, exchanging links, distributing articles, posting messages on forums and blogs which contain links, registering in directories, and more. Local Modifiers: Words used in keyword phrases that indicate a specific location. For example, if a search is done for “churches in New York City”, the “New York City” part of the keyword is a local modifier. Local Review Sites: Websites devoted to listing sites based on the physical location of the business or organization and allowing for reviewing and rating of those businesses and organizations. Some of the most popular local review sites are Insider Pages, Show Me Local, and City Search. Local Search: Searches made in the local search option of search engines. The most popular local search options are Google Maps, Yahoo Local Business, Live Local and Ask local. Local Search also refers to searches made where the keywords include local modifiers (Words used in keyword phrases that indicate a specific location. ), such as “in Boston”. Local Search Results: Results returned when searching using the local search option in the major search engines such as Google Maps, Yahoo Local Business, and MSN Local. Local SEO: Search engine optimization which targets a specific geographical region, such as a city or state. All of the major search engines currently have local search options which limit search queries to a specific geographical region. Local SEO focuses on improving search results in these local search options as well as in the universal search results for keywords which include locations. META Tag: HTML or XHTML elements given in the head of a web page used to give information and instructions for search engines and web browsers. In terms of search engine optimization, the most common meta tags are the keyword and description tags. There are also META tags which determine the behavior of search bots, language, content type and other information/settings. Navigation Menu: A menu or list of links on a website which provide the means of moving from one page to another within a website. Off-page Optimization: Search optimization strategies employed in other places than the page being optimized. This most often refers to link building and the optimization of inbound links. Online Tools: Software and websites found online which perform a specific automated function. Some online tools provide information such as keyword popularity or page strength. Other online tools provide an service such as article distribution or search registration. On-page Optimization: Optimization modifications made to the web page being optimized. This includes both visible content and content not visible to visitors (behind-the-scenes optimization). One-Way Link: When one site links to another without the other site linking back. Optimize: The process of making a website optimally readable for the search engines as well as arranging various elements of a page in order to indicate to the search engines what keywords to list the site for. Online files, such as media files, e-books and pictures can also be optimized. Organic Listing: A listing in search engines which is not paid for. There are two types of listings in the displayed in the Search Engine Results Pages (SERPs), sponsored listings (such as Google Adwords listings) that are paid for and organic listings which are free. Pay-Per-Click Search Marketing (PPC): A form of search marketing where the marketer pays to be placed in the results of certain searches. The marketer’s “ad” (or listing) is displayed when someone searches for certain keywords. The listing of the ad does not cost anything; however, every time someone clicks on the ad there is a small fee. This can be a way of getting listed for keywords which a site could not rank for in the organic search results. Some of the most popular pay-per-click search marketing programs are Google’s Adwords and Yahoo’s Search Marketing services. Page Strength: The value given to a web page by a search engine. This determined by several factors, the most important of which is inbound links. Page strength plays a role in what keywords a page can rank for. Among other strategies, page strength can be increased by link building, increasing traffic to the site, and simply by the length of time a website has been active. Reciprocal Linking: Commonly referred to as a link exchange, reciprocal linking is when two websites link to each other. Relevant Website: A website related to the same topic as another website. For example, a website about church supplies is relevant to another website about church supplies. Website relevancy is determined on a scale. So, it is not necessarily a question of whether a website is relevant to another, but rather, how relevant one site is to the other. For example, a Presbyterian church website is relevant to a Baptist church website, but not as relevant as another Presbyterian church website. Search Engine: A tool used to search the internet for websites, web pages and other files. These search engines use complex algorithms to locate, analyze, and catalog web pages and other online files. They also provide a user interface where online users can enter search words or phrases and the search engines return the websites and other online files which they have determined to be most relevant to the search word or phrase. The most popular search engines currently are Google, Yahoo, MSN and Ask. Learn more about how search engines work in the CMO article, “How Search Engines Work”. Search Engine Marketing (SEM): This refers to any form of marketing done involving search engines including search engine optimization, pay-per-click search marketing (IE Adwords or Yahoo Business Marketing), and link building. Search Engine Results Page: The page listing the results when searching for a specific keyword. These results can be web pages, media files, graphic files, news articles and more, but are primarily web pages. 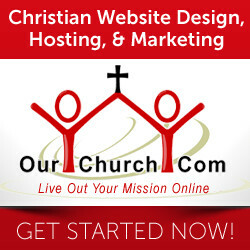 For example, if you search for the keyword “Christian Website Hosting”, OurChurch.Com has the first listing in the SERPs for “Christian Website Hosting”. Search Listing: An entry in the results of a query in a search engine for a specific web page or website. Search Ranking Report: A display or listing of a website’s positions in the Search Engine Results Pages (SERPs) for specific keywords in specific search engines. Search Rankings: The placement of a website’s listing within the search engine results page (SERPs) for a specific keyword. If a website is the first site listed in the search engine results page, then it is said to have a #1 ranking. Search Spider: (aka search crawler or search bot) A reference to the software search engines use to find, catalog, and analyze web pages and online files. SEM: (See Search Engine Marketing) SEM also refers to Search Engine Marketer, a person who employs the practices of search engine marketing. SEO: (See Search Engine Optimization) SEO also refers to Search Engine Optimizer, a person who employs the practices of search engine optimization. Title Attribute: The title attribute is an attribute added to a link intended to give additional information about links. Link text may be short or a graphic. The title attribute allows a designer to give more information that is given in the link text or graphic. Title attributes are to links what alt tags are to pictures. Just add title=”” in the A tag. Like the alt tag, title attributes are visible to visitors if they mouse over the link. Tip: If you have graphical link, you can use both an alt and a title tag. Title Tag: The Title tag is an element found in the head of the page. It is the text located between the title and /title tags. The Title tag is visible to visitors, but not in the body of the page, rather it is displayed in the top bar of the web browser. The Title tag should be a short description of the page and should contain the keywords you want to target for a page. This is one of the most important elements in on-page optimization. Universal Search Results: Results returned when searching using the regular search option such as searching from Google.com or Yahoo.com. This is what people typically refer to as search results. The term “universal” is now used because search engines include not only websites, but media files, local results, e-books, pictures, and news when using their regular search feature. Viral Marketing Campaign: A marketing strategy which relies on word of mouth to spread the information or media. The idea is to release something that is so interesting that the people who come across it share it with the people they know, who in turn share it with people they know, etc. The information spread like a virus from one person to the next, thus the name Viral Marketing Campaign. Web Page: A file containing information that accessible over the Internet and is viewable using a web browser. Web Traffic: The measurement of visitors to a website or web page. Website: A linked group of related web pages which are on the same server under the same domain and are usually controlled by the same individual or organization. White Hat SEO: Search Engine Optimization practices which are approved by the search engines. We will be adding more terms to the dictionary over time, so bookmark this page and keep checking back. i think a title tag is so important in seo work. it needs you keywords in it. These are must-know terms especially for SEO newbies. Thanks a lot for sharing this sort-of glossary. These jargons can still be confusing even for some people who have already been doing SEO for years. Affiliate marketers commence the year simply by couples developments, critiquing past approaches and making completely new versions for the year. Among the instruments anybody must have in 2010 is surely an up to date Internet marketing glossary involving conditions. That helpful object provides a speedy information to every one the normal conditions each and every starter should be aware such as newest terms of which veteran entrepreneurs ought to help to increase their particular words. Web browsing with new plug-ins has become much easier. All the same, a lot of people sitting on the internet every day to this, they are already accustomed! This glossary of your work is very clear, as for me. All the same, it is important to have sufficient knowledge in this industry! SEO is all about sending strong signals to Google that your website has value to offer and respects all the onpage and offpage standards that they want you to apply.